‘The book is sinister, enveloped in gloom – yes, and Decadent . . . but it is strong, it has authenticity . 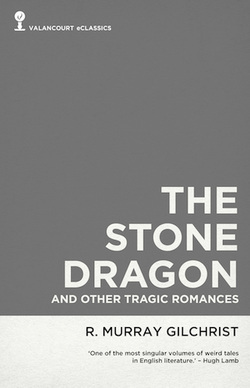 . . there is nothing quite like The Stone Dragon in modern English fiction: but in it you may distinctly trace the influence of Poe, and perhaps also Villiers de l’Isle Adam and Charles Baudelaire.’ Thus one anonymous contemporary critic summed up R. Murray Gilchrist’s first (and only) collection of Gothic and weird tales, The Stone Dragon and Other Tragic Romances (1894). Extremely scarce in its original edition, Gilchrist’s book has gone on to be recognized as a classic of Decadent and horror fiction. Told in a hauntingly beautiful prose, Gilchrist’s tales of murder, madness, and doomed love exercise a fascination that is wholly unique. This digital edition reprints the unabridged text of the 1894 Methuen first edition and includes the stories ‘The Stone Dragon’, ‘The Manuscript of Francis Shackerley’, ‘Midsummer Madness’, ‘The Lost Mistress’, ‘Witch In-Grain’, ‘The Noble Courtesan’, ‘The Writings of Althea Swarthmoor’, ‘The Return’, ‘The Basilisk’, ‘Dame Inowslad’, ‘Excerpts from Pliny Witherton’s Journal: Also a Letter of Crystalla’s’, ‘My Friend’, ‘Roxana Runs Lunatick’, and ‘The Pageant of Ghosts’.